The small plan starts at Rs 149 for 0.3GB data along with access to 100 SMSes. 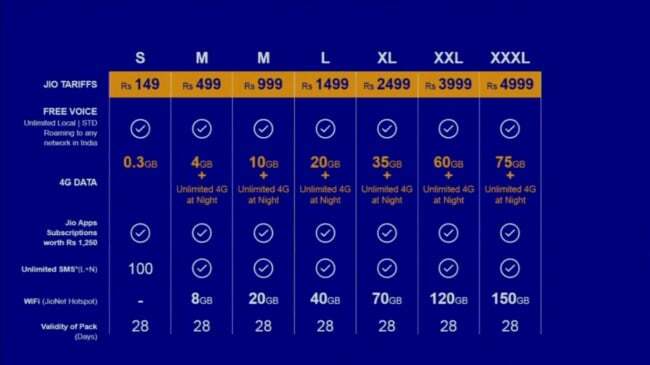 There’s a Rs 499 Medium pack which comes at Rs 499 for 4GB 4G data and access to unlimited 4G at night. The Large, XL, XXL and XXXL 4G packs are priced at Rs 999, Rs 1,499, Rs 2,499, Rs 3,999 and Rs 4,999, respectively. The Reliance Jio data packs give users an access to free voice calls. The Reliance Jio data packs give users an access to free voice calls and Jio premium apps. Jio Premium apps include JioPlay, JioOnDemand, JioBeats, JioMags, JioXpressNews, JioDrive, JioSecurity and JioMoney. Reliance Jio data packs with access to Jio premium apps is free till December 31, 2017. Users will be charged as per these data packs after December 31. During the AGM event, Ambani announced that all voice calls for Jio customers will be free of cost. Also, there will be no roaming charges for customers for Jio customers. He added that international roaming rates will also be cheaper than the rivals, though he did not announced the rates.